T.K. Whitaker at the establishment of the Whitaker Institute at NUI Galway, with NUI Galway President Jim Browne, 2012. “On behalf of NUI Galway, I want to express great sadness at the passing of one of the Ireland’s most exemplary public servants. 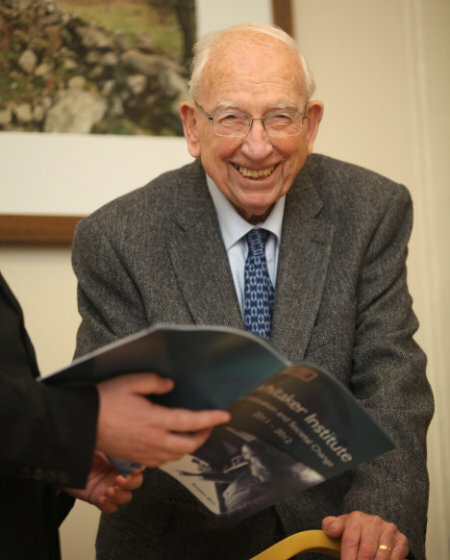 In a career defined by innovation and dedication, Dr TK Whitaker led the transformation of Irish economic policy which has shaped modern Ireland. His service to the State continued long beyond his retirement in 1976 and had a major impact on many of facets of Irish life with more than 40 organisations having benefited from his wisdom and leadership. For those of us in academic life, we remember with fondness and high regard his Chancellorship of the National University of Ireland for over 20 years, from 1976 to 1996, at a time when higher education in Ireland underwent its most radical transformation. We are honoured that the Whitaker Institute at NUI Galway stands as acknowledgement of his stature as a policy leader whose legacy will be to have shaped modern Ireland as a sustainable economy, an inclusive society, and a healthy democracy where academic debate and public discourse engage together to advance the greater good. “Thar ceann OÉ Gaillimh, ba mhaith liom ár mórbhrón a chur in iúl go bhfuil duine de mhórsheirbhísigh eiseamláireacha poiblí na hÉireann ar lár. 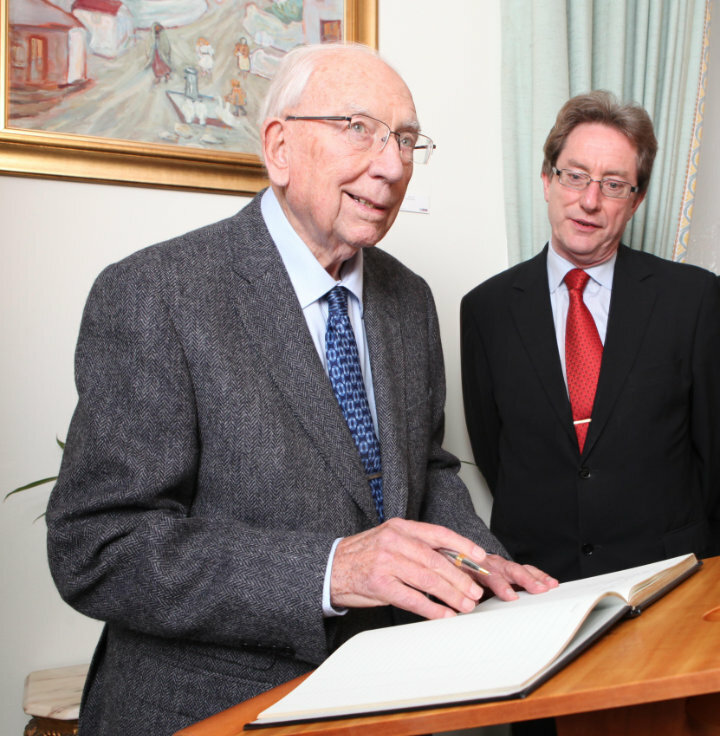 Ba cheannródaí tiomanta an Dr TK Whitaker ar feadh a shaoil ghairmiúil agus stiúraigh sé an claochló ó bhonn a tháinig ar pholasaí eacnamaíoch na hÉireann a mhúnlaigh Éire na linne seo. Thug sé seirbhís don Stát i bhfad i ndiaidh dó dul ar scor in 1976 agus bhí mórthionchar aige ar an iliomad gné de shaol na hÉireann. Chuaigh a chuid ceannaireachta agus géarchúise chun tairbhe bhreis agus dhá scór eagraíocht. Cuimhnímidne sa saol acadúil, le hardmheas agus le cion, ar a théarma Seansailéireachta ar Ollscoil na hÉireann ar feadh tréimhse de scór bliain, ó 1976 go 1996, tráth a ndeachaigh mórathrú ar an ardoideachas in Éirinn. Cúis bhróid dúinn gurb ann d’Institiúid Whitaker in OÉ Gaillimh ar aitheantas é ar a sheasamh mar cheannródaí polasaí. Clocha ar a charn gur mhúnlaigh sé Éire na linne seo mar gheilleagar inbhuanaithe, mar shochaí chuimsitheach agus mar dhaonlathas folláin, áit a mbíonn caibidil acadúil agus an dioscúrsa poiblí ag cur lena chéile chun leas an phobail. It is with great sadness that we have learned of the death of Dr T.K. Whitaker, eponym of the Whitaker Institute at NUI Galway. Dr Whitaker devoted his professional life to formulating and influencing public policy to promote the economic and social advancement of all the Irish people. His plan for economic development transformed the Irish business sector and set the course for an open, competitive Ireland to succeed in the global economy. As a senior public servant, he led from the front in the modernisation of Ireland’s public sector. The enduring relevance of his life’s work is testimony to his extraordinary intelligence and foresight. We all at the Whitaker Institute remember a brilliant economist and dedicated public servant, recall his immense contribution to public life in Ireland, and extend our deepest sympathies to his family. "Dr Whitaker put an emphasis on economic growth, but not growth for growth’s sake; rather economic development to benefit the wellbeing of all citizens and create a better society"
Professor Alan Ahearne Director of the Whitaker Institute, Professor of Economics at NUI Galway. T.K. Whitaker, voted the Irishman of the 20th Century, is widely regarded as the architect of modern Ireland. A brilliant and dedicated public servant, his seminal 1958 blueprint for economic development transformed the Irish economy and set the course for an open Ireland to prosper in a globalised world. Dr Whitaker also played a pivotal role in the search for peace in Northern Ireland, and in the modernisation of Ireland’s public sector. Although much in Ireland has changed over recent decades, the lessons learned from Dr Whitaker’s life’s work still reverberate today. His legacy challenges us all to demand the “establishment of a better social order, the raising of human dignity and, eventually, the participation of all” in the benefits of globalisation and economic growth. "The way he was able to look into the future and see the problems the economy was going to face and take remedial action"
Some of Ireland’s leading social scientists, gathered at NUI Galway in November 2016, share their reflections about the lessons learned from T.K. Whitaker’s life’s work and his impact on the Irish economy, society and the well-being of citizens. "T.K. 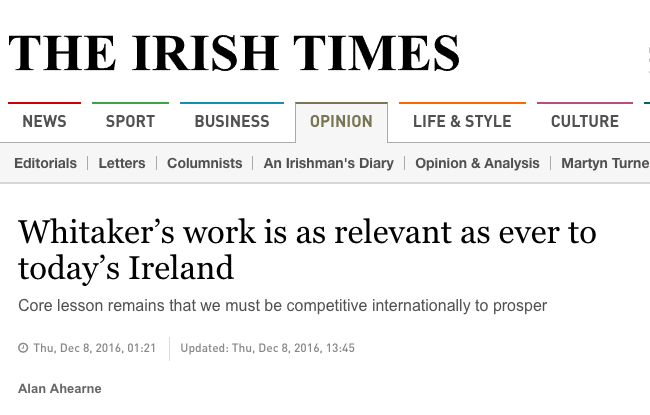 Whitaker was extremely important in terms of helping us towards an outward focused industrial strategy"
"Whitaker's work is as relevant as ever to today's Ireland", Professor Alan Ahearne, The Irish Times, 8th December, 2016. Professor Alan Ahearne, The Irish Times, 8th December, 2016. Every country has its heroes. Some are generals, some are conquerors, some even tinsel celebrities. Few countries would nominate a long-retired civil servant. 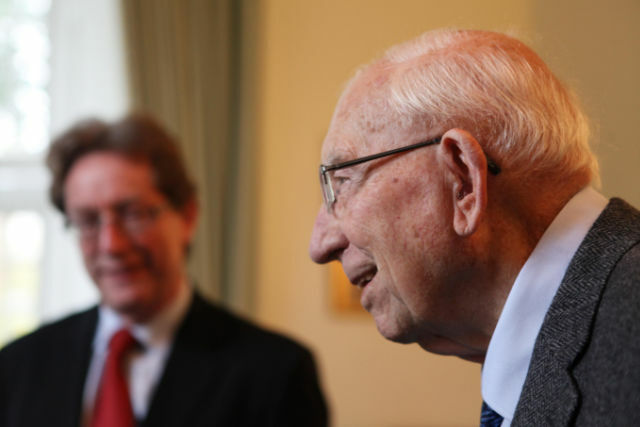 However, in 2002, Irish people, when polled to name the "Irishman of the century", chose TK Whitaker, the man regarded as the the architect of modern Ireland. Today Ken Whitaker celebrates his 100th birthday. "There a very, very few people internationally who would have crossed the policy areas that he crossed"
Featuring Governor Philip R Lane, Director of NUI Galway Whitaker Institute Alan Ahearne, Biographer Anne Chambers and Central Bank Records Manager Ross Higgins.